The Glass Squid: a whole lot of nothing. Okay class, now who can tell me where the brain is located? Anyone? Anyone know the answer? Neither do we. 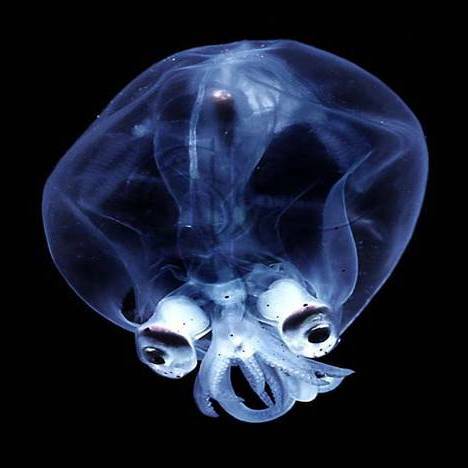 But we do know the Glass Squid is one very creepy animal with not much going on. Transparent skin, ridiculously short arms, telescopic eyes and a enormous sack of emptiness. That’s it. Class dismissed! thats a google eyed squid in the mid ocene deepth. i could see the inside of its stomic. My god! Metroid’s are real!